“You have died of dysentery.” Anyone who’s played the classic educational computer game, The Oregon Trail, has heard these dire words. 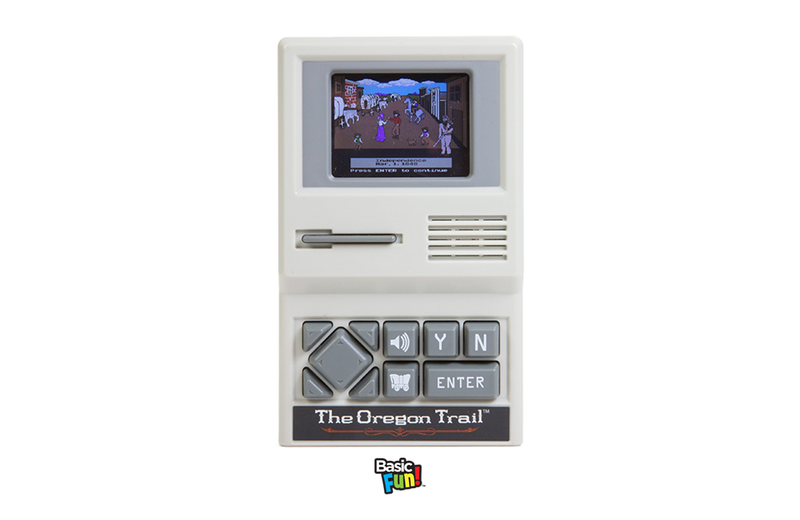 Originally released in 1974, the game taught players about the hardships of 19th-century pioneer life on the Oregon Trail. Since that time, a variety of game developers and distributors have released it in various forms and editions. Most recently, Basic Fun! Toys has thrown its hat into the ring with a new hand-held electronic version. Running on three AA-batteries, the game captures all the 1980s appeal of the original, serving up authentic graphics and sound effects from back in the day. The handheld is also decidedly retro in form, drawing inspiration from early Apple-style button and colour schemes. You can set out on your hand-held trek from Independence, Missouri to Oregon’s Willamette Valley for $24.99 USD. The hand-held can be found exclusively at Target Stores and online. Take a weekly look at a modern-day thing with a nostalgic influence. In honour of the iconic toy line’s 30th anniversary, Mattel has collaborated with Hot Topic to release an official Polly Pocket-inspired makeup and accessories line. Monopoly is available in many versions, and now you can have (or gift) a customized Monopoly game at the Custom Made Kitsch Etsy store.